There are few times in my life that I would write a blog post solely on customer service. This is a story of a chocolate loving raccoon and a company who went above and beyond to fix something that was not their fault: The Knot. They came to the plate big time and their customer service amazed me - a big thank you to their agent Destiny who saved the day. My parents house has become ground zero for everything wedding related. We don't have the space to store anything in our condo. Not to mention, while I am very detail oriented, I am horribly disorganized and tend to lose stuff. 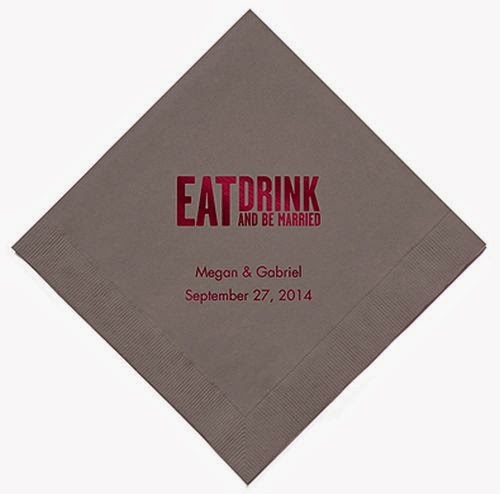 A few weeks ago, The Knot was having a huge sale on personalized Napkins, $9.99 w/ free personalizing and shipping. 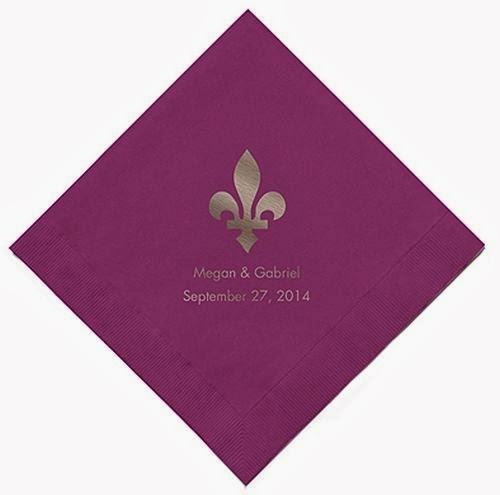 We ordered a set of Eat Drink and Be Married along with a set of Fleur de Lis since we are getting married in New Orleans. 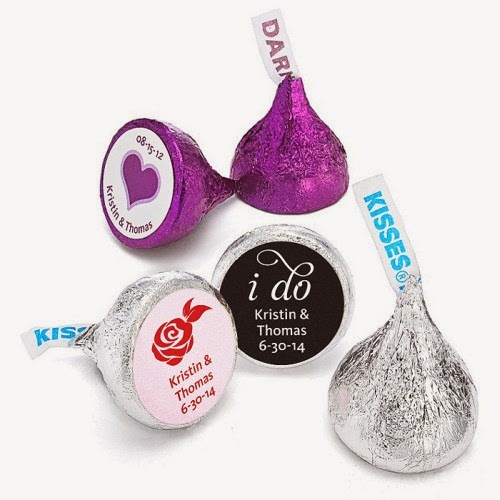 Mom instructed me to order the two sets along with personalized Hershey Kisses, which were also the cheapest we have seen. Since we got free shipping, we figured why not? We could freeze them leading up to the wedding and all would be fine. I found it odd that Mom hadn't told me the package from the Knot had arrived but never questioned it. Although I should have........They live on a golf course and have raccoon's who come out during the day. They like to steal dog food and apparently wedding shipments. I was on the phone with my Mom when my Step-Dad Hank exclaimed "where did these Hershey kisses come from and why are they all over the back yard?? Wait, they say Megan and Gabe......." Mom and I both went silent. He found 7 dark chocolate kisses. Mind you, they come in packs of 100, which meant there were 193 missing Hershey Kisses. Mom and Hank found the box which once contained the Hershey kisses and napkins by the canal. This whole scenario was not the Knot's fault. UPS left the box at the door and ran, as they do every time a shipment is dropped off - my 9lb toy dachshund scares off the drivers. It's quite comical to watch actually. When I called the Knot, my intention was to try to repurchase them at the price I originally got them for - they had gone up double in price since the day I ordered. The Knot replaced them and reshipped them with no cost to me. WHAT!! Thank you so much to both The Knot & Destiny for her customer service excellence. This was above and beyond what I expected. 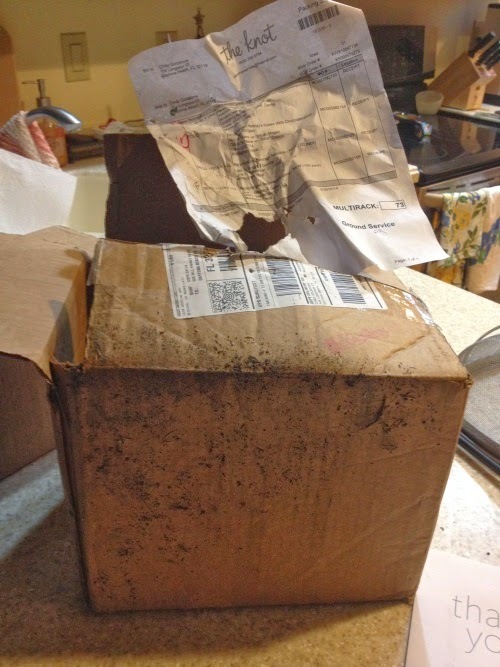 I learned a lesson from this - if you are ordering anything perishable, have it sent to your office. And raccoon's like milk chocolate better than dark chocolate. This is too funny! Glad it got worked out. That's hilarious! Great service from The Knot to make it right for you, too. Oh my gosh, haha! So glad it all worked out. Damn raccoons.